Gurudwara Details: A MASSIVE 6-7 storey Sikh Gurduara in the heart of the Business district built in 1911. Run under the auspices of the THAI SIKH ORGANISATION. Functions held daily, also houses Medical facilities, School and various other Sikh organisations. 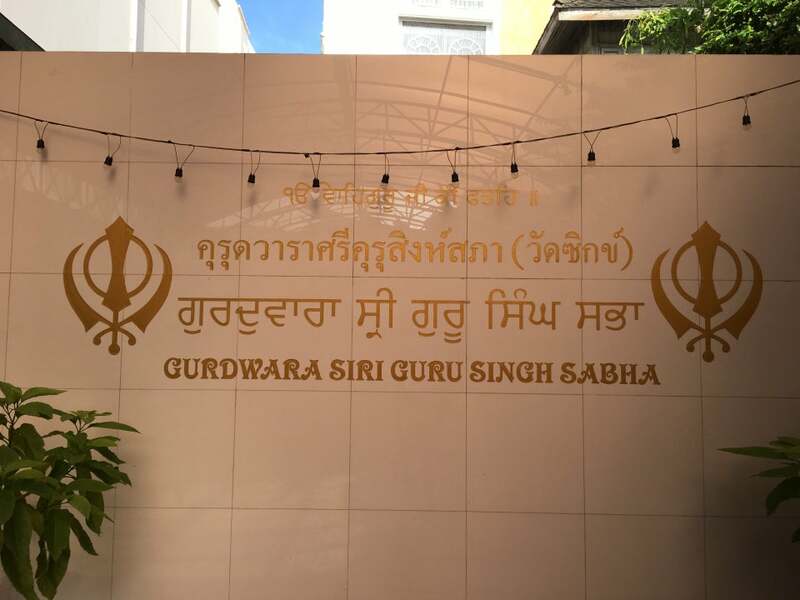 This Gurduara is a MUST for Sikh visitors in Bangkok, there about 26 other Gurduaras in Thailand, although the Sikh Thai Org, only records about 17. During the 2nd WWar 2 bombs fell directly on the building, with several hundred Sikhs sheltering, but they failed to explode. NOTE: when you arrive you will need to remove your shoes and cover you head, ask for help in the ground floor foyer. Among the first Indians to arrive in Thailand was Kirparam Madan in 1884. He was a Sehajdhari Sikh from Bhadewal village in the district of Sialkot (now in Pakistan). He was granted an audience with King Rama V of Thailand. He brought his relatives whose surnames were Madan, Narula and Chawla. They were among the first members of the Indian diaspora in Thailand, who started to arrive in the late 19th century. By 1911, many Sikh families had settled in Thailand. At that time Bangkok was the centre of migrant Sikhs, but there was no Gurdwara, so religious prayers were held in the homes of the Sikhs in rotation on every Sunday and all the Gurpurab days. In 1912, the Sikhs decided to establish a Gurdwara. A wooden house was rented in the vicinity of Baan Moh, a well known business area. In 1913 (or the year 2456 according to the Buddhist calendar), with the continuing increase of the Sikh community, a new larger wooden house was leased for a long term at the corner of Phahurat and Chakraphet road. After considerable renovation and decoration, the Guru Granth Sahib was installed and religious prayers were conducted on a daily basis. As time passed, in 1979, the decision was made to renovate the Gurdwara and make it bigger to accommodate the increasing number of Sikhs. Together the committee of Siri Guru Singh Sabha and the other Thai-Sikhs decided to construct a new Gurdwara at the same location. The foundation stone was laid down by the Panj Piare, the Five Beloved Ones. The new Gurdwara was completed after two years in 1981.